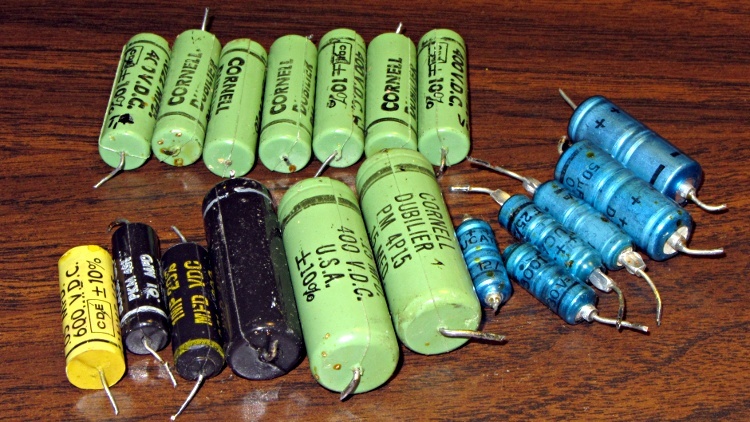 Before trashing (*) all those caps from the Ampeg, I marched them past a capacitance meter that gives the dissipation factor D. As D = tan δ = ESR / ¦X¦, we know ESR = D*¦X¦ at the meter’s 1 kHz test frequency. We don’t know the magnitude of the total reactance X (the meter doesn’t tell us that) and in this case we can’t assume the ESR will be small with respect to the capacitive reactance Xc = 1/2πfC. The smaller green 0.022 µF Cornell-Dubilier caps all came in with D=0.05, so they’re marginal. 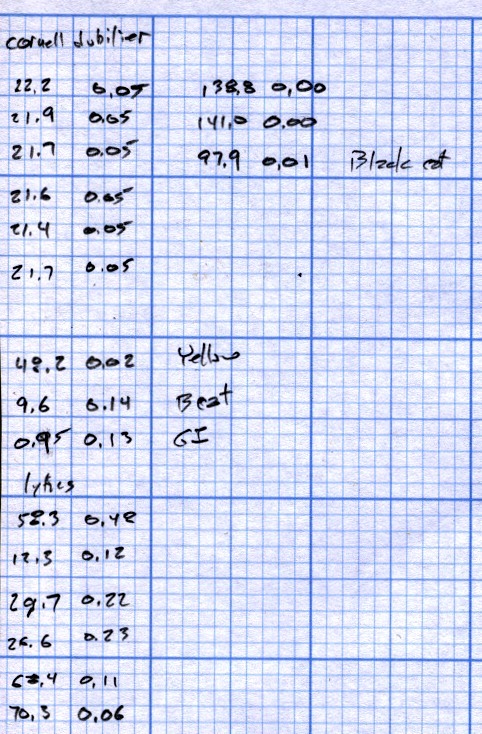 The larger green 0.15 µF Cornell-Dubilier caps had D=0.00 and the black 0.1 µF was D=0.01. Those are OK. The small black caps had D=0.14. Yikes! The larger one and the yellow cap had D= 0.01 or 0.02. The blue Ducati (!) electrolytics ranged from 0.06 to 0.48. That was without reforming, as the last time Phil turned it on, the finals about melted down: I wasn’t going to risk that again just to find out if you can reform all the electrolytic caps without the tubes in place. So, yeah, some of the coupling caps were exceedingly bad. If you’d like to rub the values & data against the schematic to find out which one(s) were killing the finals, go ahead. All of the measured capacitance values were within spitting distance of their nominal values. (*) They’re in the e-waste recycling box, of course.